Muse Drones World Tour: One more night with the orbs. – music waffle. On Thursday 12th July, for one night only, Muse fans could revisit their magnificent Drones tour from the comfort of a cinema seat. 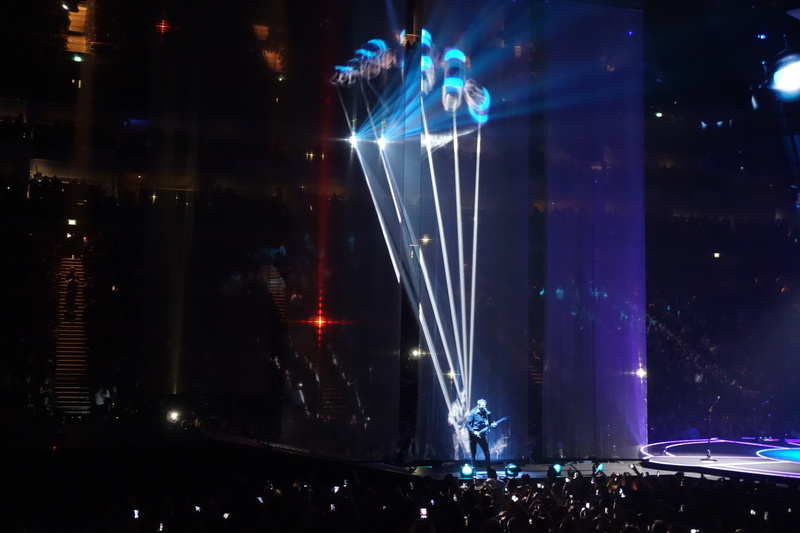 A stunning spectacle from an arena viewpoint, this was the chance to get the full 360 take on the show, as well as getting some idea of the band’s view of the show as banks of spectators came into view. Kicking off with Psycho and followed by Reapers (complete with guitar cam footage of Matt Bellamy’s impressive fretwork), by the time it got to Hysteria, many of the audience had overcome the British reserve and due respect of the “Never talk when the film is on” rule and were happily singing along. Indeed at the rear, many fans were standing and getting as excited as if they were at the gig itself. Highlights for me were the clever puppet hands “working” Matt and Chris during The Handler, the euphoric crowd singalong to “love” at the end of the wonderful Madness and the exceptional visuals, including a flypast by Thunderbird 2 during The Globalist. And the fact that the cameraman caught the normally serious Chris Wolstenholme smiling and laughing on several occasions. It’s a job to know how the band will exceed this experience on their next tour, but they are so reliably professional that you know they will create something well worth the money on their next outing. Hopefully a DVD release will follow in due course.